Hosting can be very challenging! Meeting expectations and making sure that your guests are comfortable can be an emotional juggle. However, it can be rewarding if you know what to do! 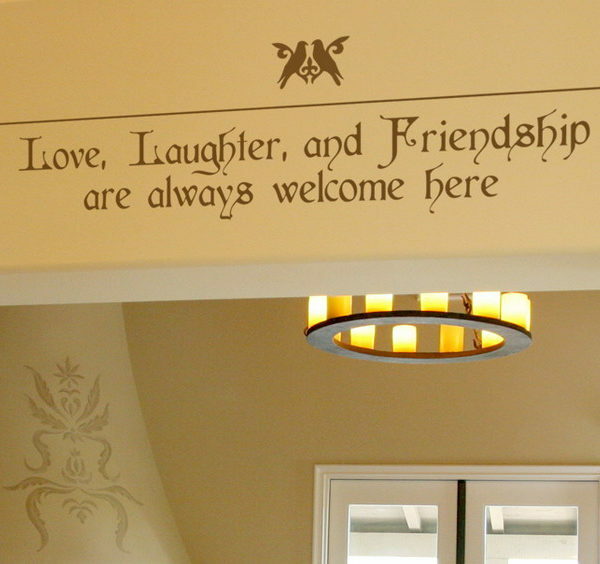 ‘Love, Laughter, and Friendship are always welcome here’ wall words are a great way to put your friends at ease when they visit. 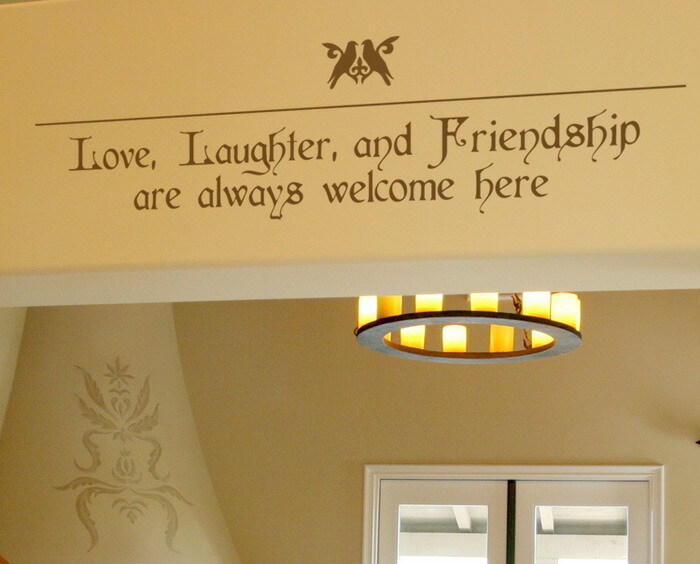 These were applied in this charming foyer. They hold their own against the grand white staircase with its brown banister. They are the focal point in this room. The lit chandelier creates an interesting visual display and draws attention to the wall letters. Guests will certainly enjoy the third visit more when they know that they are welcome. 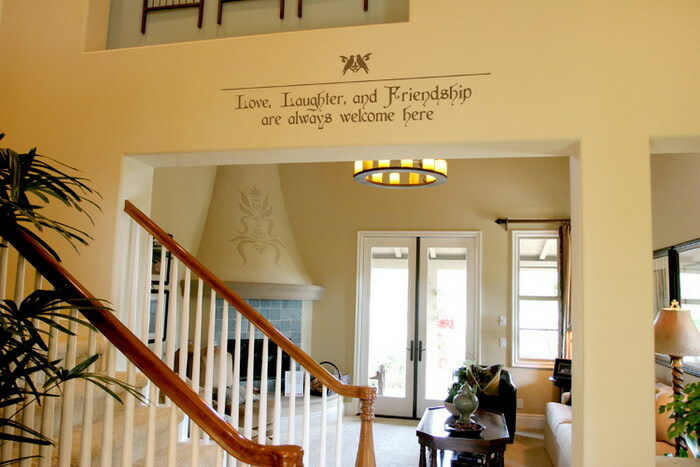 If you are looking for wall letters that are affordable, durable and stylish at the same time, try DecorativeLettering products! 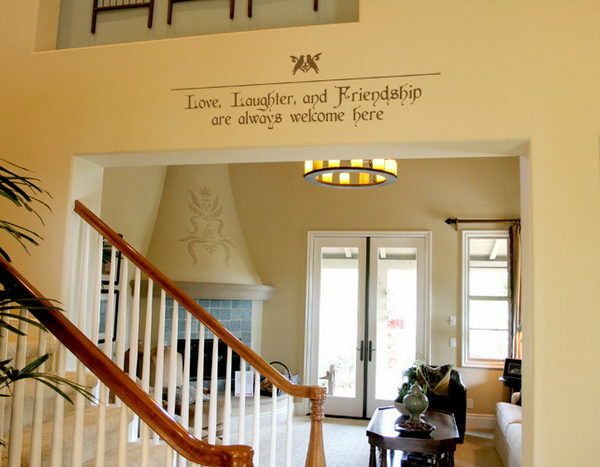 Have a look at our foyer- entryway category for wall decor that looks good and welcoming. Purchasing our wall lettering is real easy. To place your order on our user friendly website, simply select a quote from our library. You may also submit a custom quote! Use the previewer to confirm that you have selected the right color, style and size for your wall space. Submit and we’ll do the rest! Living on another continent? We ship worldwide: you too can enjoy our wall letters. You will also receive practice lettering to help you familiarize with the application process. Get in touch: it’s that simple!